Oh right! I would like to thank some people who suggested some things in this wallie....Shinn84, Semanga, Kitten and my good friends at MDF forums!!! Oh....and thanks to those people who fav my first wallie which suxed because I still didn't know better. comments/suggestions/favs are very much appreciated!!! Extra: Original scan can be found here...submitted by Akachan. i love the background layout haia u did a excellent good job i give u alot credits and alot hard work for your masterpiece here a 10 out 10 for it. The city looks so great! I like the woman in the scan too..! Nice background for your wallpaper and it's nice. I like the moon so much. I like it .It is very good art. The background's pretty cool and I love the light-shadow effect on the moon. But is there anyway possile that you could make sakura a *leeeeetle* bit bigger? hmm.. thats a interesting looking wall. I like the background, it looked alot better when what it shows on the thumbnail. 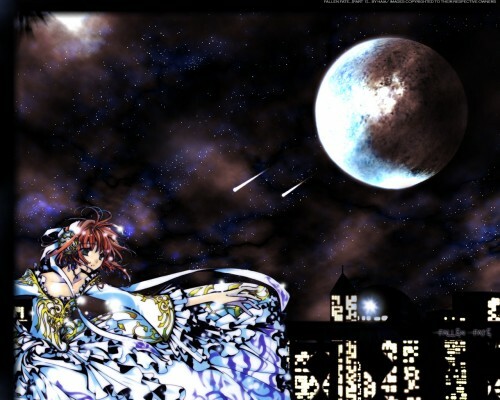 I love the background with the moon! Haia you did a excelent work!